H.E. Grand Chief Sir Michael Ogio, GCL, GCMG, KStJ, Governor General of Papua New Guinea, has executed on behalf of the State a project agreement contract for an oil palm processing facility with major infrastructure development for Pomio District in East New Britain province. The Revised Illi-Wawas Integrated Rural Development Project agreement was signed between the State, East New Britain Provincial Government and developer Tzen Niuginii Ltd and Tzen Plantation Limited at Government House yesterday. East New Britain Governor Hon. Ereman ToBaining Jr, Department of Trade, Commerce and Industry Secretary, Mr. John Andrias and Tzen Niugin (PNG) Ltd representatives Mr. Tan Eng Kwee and Mr. Michael Paisparea also witnessed and signed the project agreement. The signing of the project agreement now paves way for further major infrastructure development in Pomio district including construction of roads and bridges, logging, oil palm development to be located in Pomio District and reforestation activities for the district once referred to as the least developed district in PNG. Most of these projects will be funded by Tzen Niugini Ltd on the basis that it will derive an appropriate return on its investment and at the same time bring about economic and social benefits for the people of Pomio and PNG as a whole. One hundred and seventy thousand (170,000) hectares of land has been set aside for this Special Agricultural Business Lease (SABL) project of which 38, 500 hectares is for agriculture development. Tzen Niugini Ltd Chief Executive Officer, Mr. Tan Eng Kwee said, his company is willing to work closely with the East New Britain Provincial government to bring about much needed infrastructure development in Pomio. He said, the three major component of the project is infrastructure development (construction of roads/bridges linking Pomio Dist to Rabaul/Kokopo), schools and health facilities, agriculture (cocoa, rice, coffee production) and reforestation activities. Mr. Eng Kwee in acknowledging the landowners of Pomio District for allowing the project to go ahead, said, Papua New Guinea must do away with the mentality that foreigners are only interested in exploiting the people and the country’s natural resources. He assured that his company, which was established in PNG in 2008, was here to stay and will continue to work in partnership with the provincial government to ensure the people of Pomio District benefit from this project which will contribute towards improving their standard of living. According to Secretary of Department of Trade, Commerce and Industry, Mr. John Andrias the llli-Wawas project is by far the most successful SABL project in that since the project agreement was signed in 2008, several infrastructure development have taken place that include that much needed road linking Pomio to Kokopo. East New Britain Governor Hon. Ereman ToBaining noted that the project agreement is the result of the public private partnership arrangement between the national Government and the private sector and that this arrangement will ensure the Government in partnership with the private sector work together to deliver basic government services to the people of Papua New Guinea. The Governor also acknowledged former Member of Pomio, Paul Tienstein, current Member Hon. Elias Kapavore, Deputy Prime Minister Hon.Leo Dion and the national Government for their support towards the project. 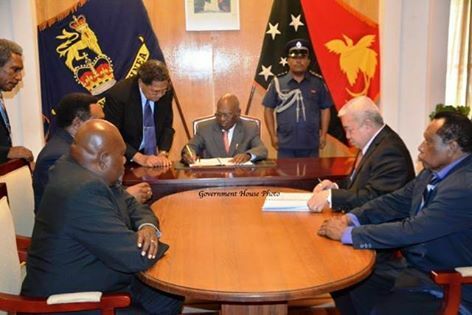 Photo caption: Governor General Grand Chief Sir Michael Ogio signing the project agreement, and looks on as parties to the agreement Tzen Niugini PNG Ltd representatives Chief Executive Officer, Mr. Tan Eng Kwee and Mr. Michael Paisparea and ENBP Governor Hon. Ereman ToBaining and Department of Trade, Commerce and Industry Secretary sign on; Governor General Grand Chief Sir Michael Ogio and the signing party pose after the contract signing ceremony; and Governor General Grand Chief Sir Michael Ogio chatting with ENBP Governor Hon. Ereman ToBaining Jr. and Tzen Niugini PNG Ltd representative Mr. Michael Paisparea. Words/pics- Government House.